The City Council consists of 7 council members, each elected to a 4 year term. Council positions are staggered so that not all council members come up for election in the same year. The Council members’ term of office are shown on the Council Members page. 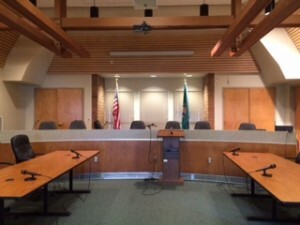 The mayor is the Chief Executive Officer of the city, and also chairs the council meetings. The mayor is not a council member, but can vote in some special circumstances. RCW 35A.12.100 specifies the mayor’s duties and voting capabilities at council meetings. The City Council meets 7:00PM on the 1st & 3rd Monday of each month, unless it is a holiday then it’s usually re-scheduled for Tuesday of the same week. For more information please explore the links on this page.